Investments, Foreign; Law and legislation. Science and technology plays an increasingly important role in the continued development of international economic law. This book brings together well-known and rising scholars to explore the status and interaction of science, technology and international economic law. 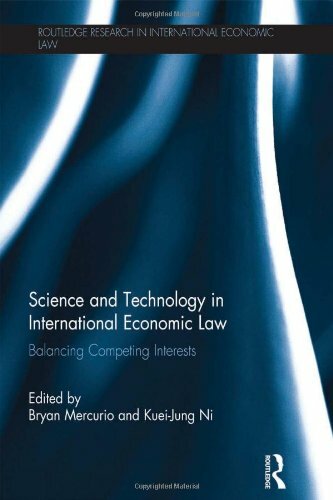 The book reviews the place of science and technology in the development of international economic law with a view to ensure a balance between the promotion of trade and investment liberalisation and decision-making based on a sound scientific process without hampering technological development. The book features chapters from a range of experts Ã¢ÂÂ including Lukasz Gruszczynski, JÃÂ¼rgen Kurtz, Andrew Mitchell and Peter K. Yu Ã¢ÂÂ who examine a wide range of issues such as investment law, international trade law, and international intellectual property. By bringing together these issues, the book asks how international trade and investment regimes utilise science and technology, and whether they do so fairly and in the interest of broader public policies. This book will be of great interest to researchers of international economic law, health law, technology law and international intellectual property law.